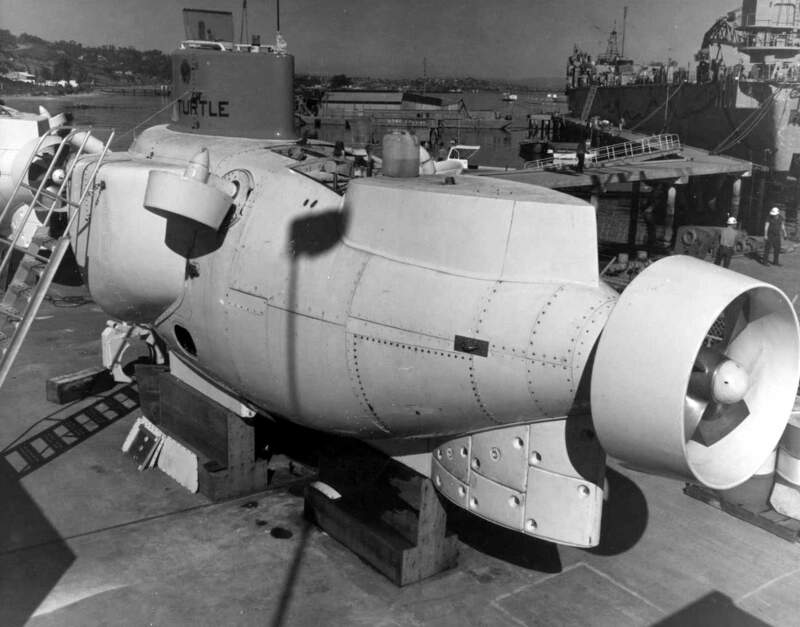 1.04k The Deep Submergence Systems Review Group recommended this undersea search vehicle to the Secretary of the Navy in a report, April 1964. The proposed vehicle will be used to investigate ocean bottoms and recover objects. 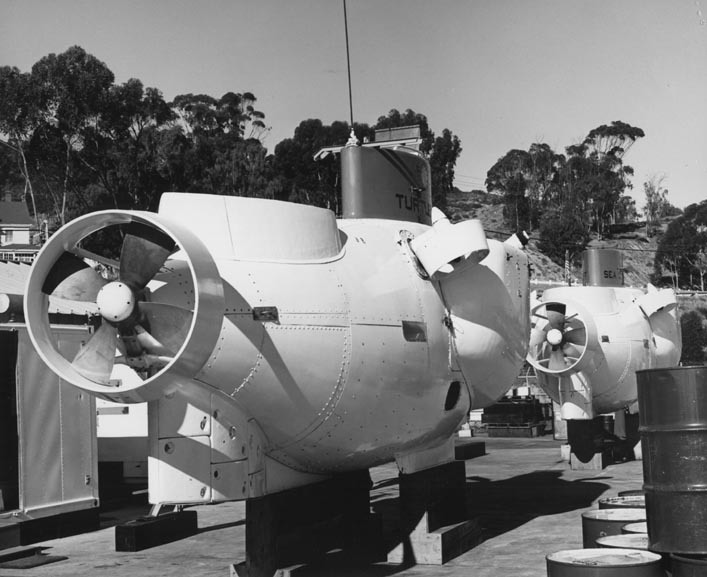 Master Caption: Following the loss of the submarine Thresher (SSN-593) in April 1963, the Secretary of the Navy established the Deep Submergence Systems Review Group to analyze the requirements for placing man at great ocean depths. 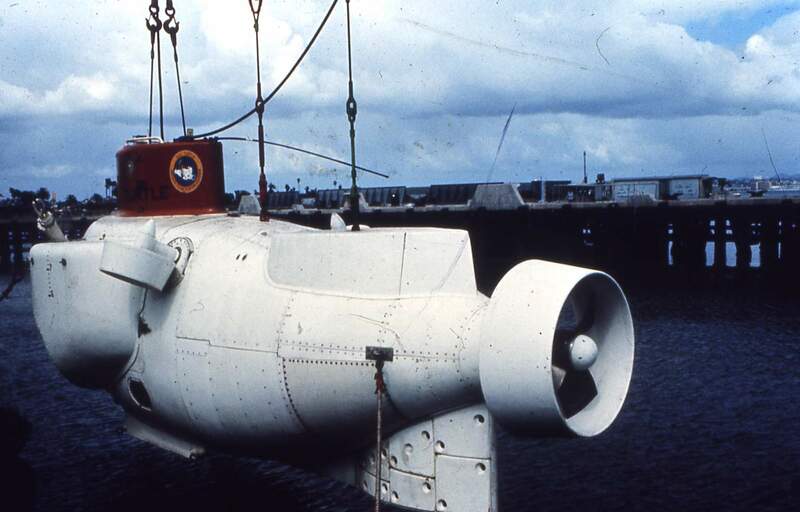 The study included an examination of plans for the development and procurement of components and systems related to the location, identification, rescue from and the recovery of large and small boats, including submarines, from the ocean floor. Photograph released 30 April 1964. USN photo # USN 711458, Photographed by PHC C.L. Wright, courtesy of the National Museum of the U.S. Navy, via flickr.com. 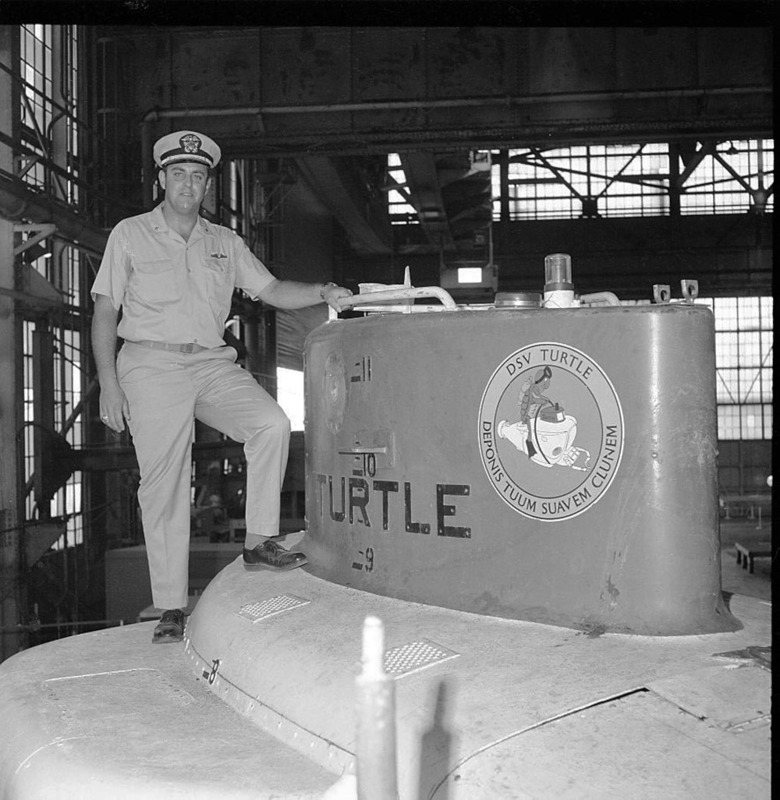 197k LCDR John F. Cameron, Officer in Charge of the Turtle (DSV-3) is seen on 2 November 1973 aboard the ship located in Mare Island's structural shop. 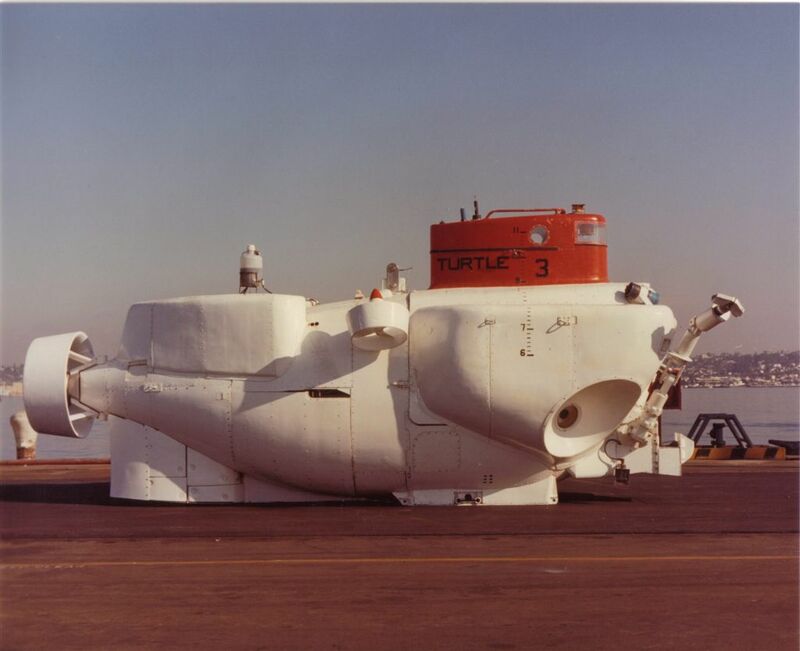 Turtle was in overhaul at Mare Island from 29 October 1973 to 17 May 1974. USN photo courtesy of Darryl L. Baker. 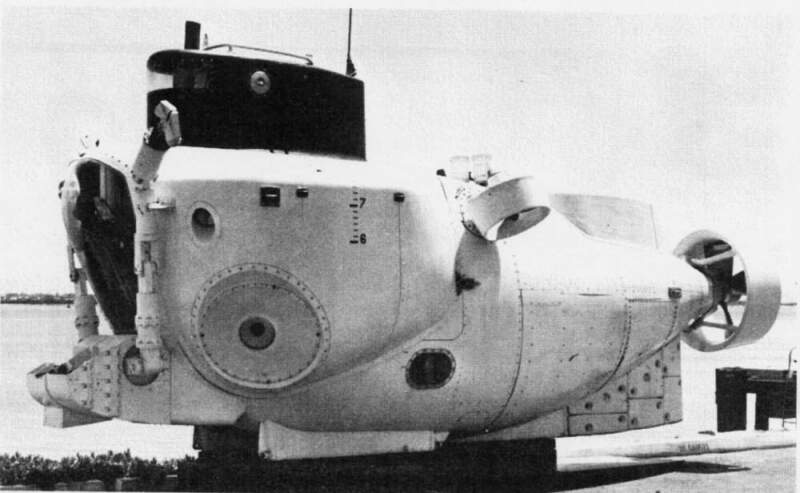 63k Turtle (DSV-3), is seen in this clipping from the 21 January 1977 issue of the Mare Island Naval Shipyard newspaper "Grapevine". USN photo courtesy of Darryl L. Baker. 102k Turtle (DSV-3), is seen aboard her transportation trailer at Mare Island after her arrival from San Diego for overhaul. She was in overhaul status at the shipyard from 29 September 1979 to 14 November 1980. USN photo courtesy of Darryl L. Baker. 72k Broadside dock view of the Turtle (DSV-3) at Mare Island. USN photo courtesy of Wendell Royce McLaughlin Jr.
157k Turtle (DSV-3) and another DSV dockside, probably the Sea Cliff (DSV-4) at Mare Island. USN photo courtesy of usssubvetsofwwii.org. 68k Turtle (DSV-3) and Sea Cliff (DSV-4) dockside, at Mare Island, possibly 10-1979. USN photo courtesy of San Francisco NARA, "Mare Island Naval Shipyard, Ship Files" & submitted by Tracy White @ Researcher @ Large. 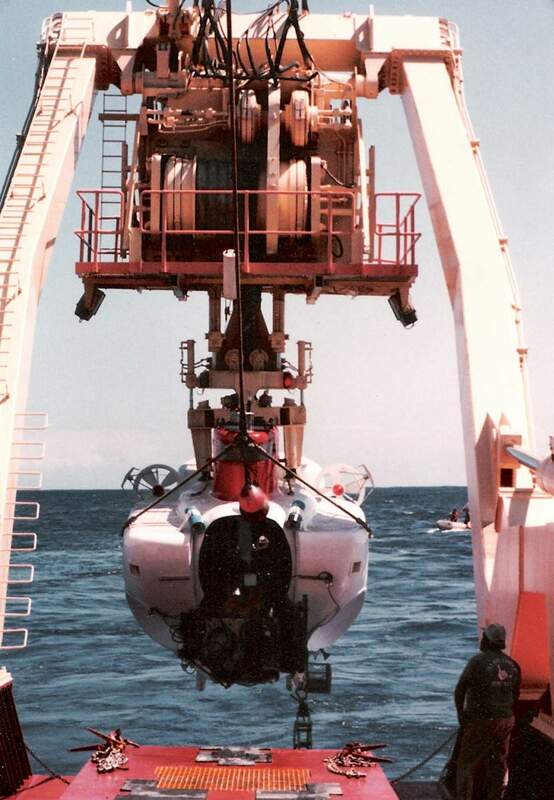 183k Four point lift for the Turtle (DSV-3): A means to load / off-load the submersible to land-transport platform or ship. The image is probably late 1970's, or early 1980's in San Diego. Photo courtesy of Pete Juhos, MMCS(SS/SS1). 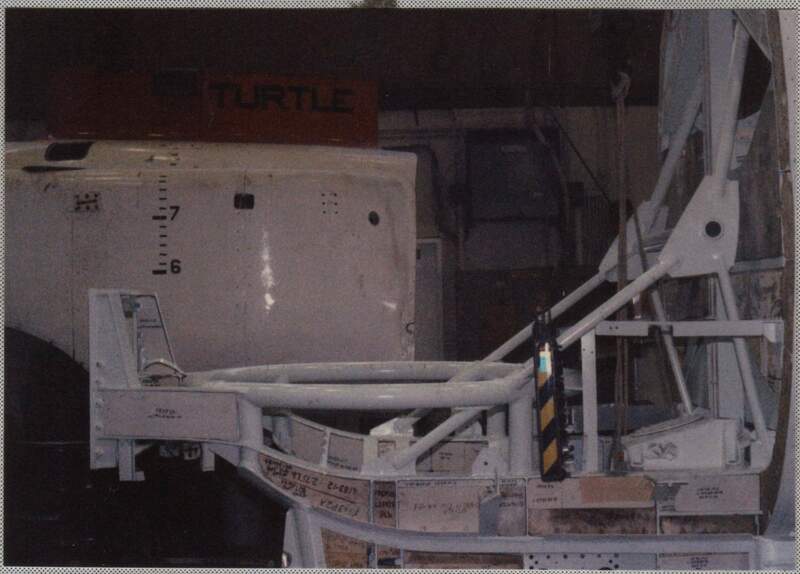 232k Frame 1 of the Turtle (DSV-3), in 1986 during her fire damage overhaul. USN photo courtesy of David Reid. 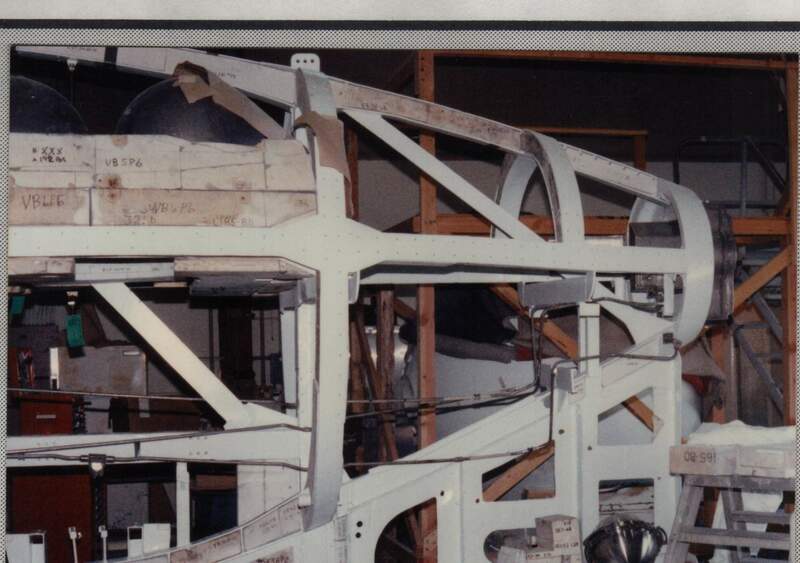 223k Frame 2 of the Turtle (DSV-3), in 1986 during her fire damage overhaul. USN photo courtesy of David Reid. 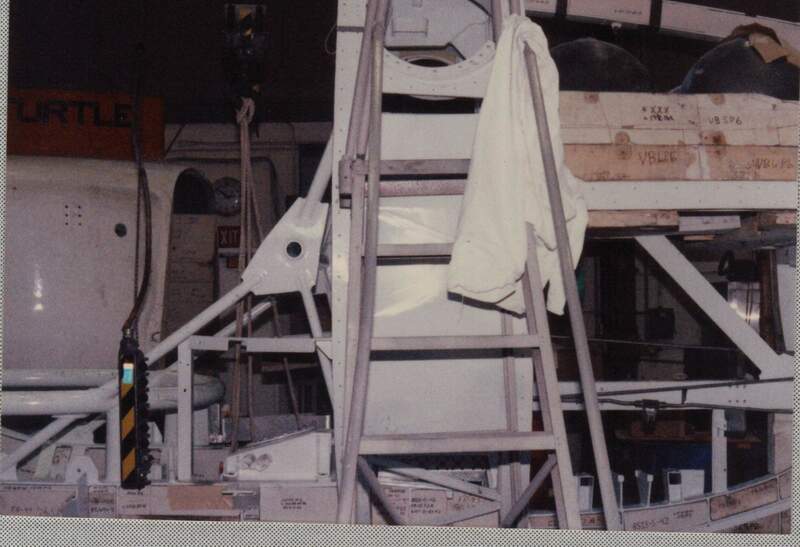 219k Frame 3 of the Turtle (DSV-3), in 1986 during her fire damage overhaul. USN photo courtesy of David Reid. 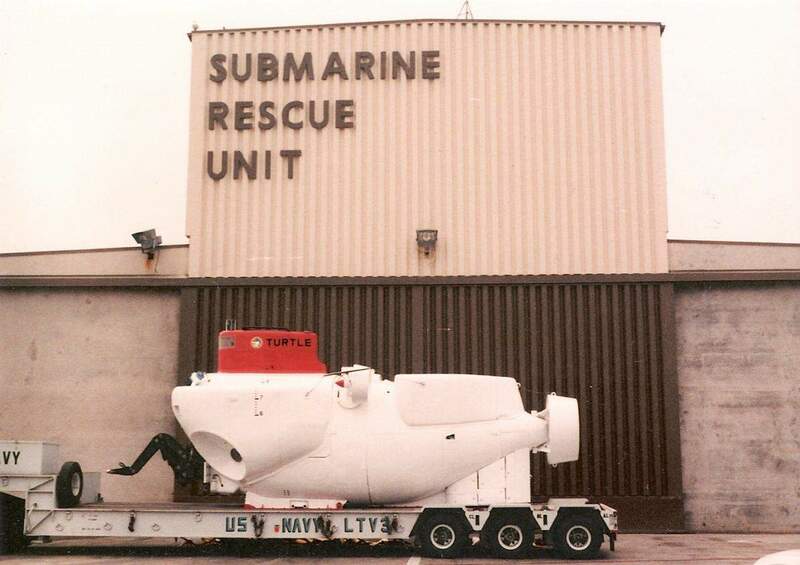 109k The LTV-3 (Land Transportation Vehicle), in front of SRU (Submarine Rescue Unit), (the name was later changed to DSU (Deep Submergence Unit) Turtle (DSV-3) is in a fresh coat of paint after an overhaul, circa 1988 - 91. Photo courtesy of Kent Weekly (Former EMCS/SS). 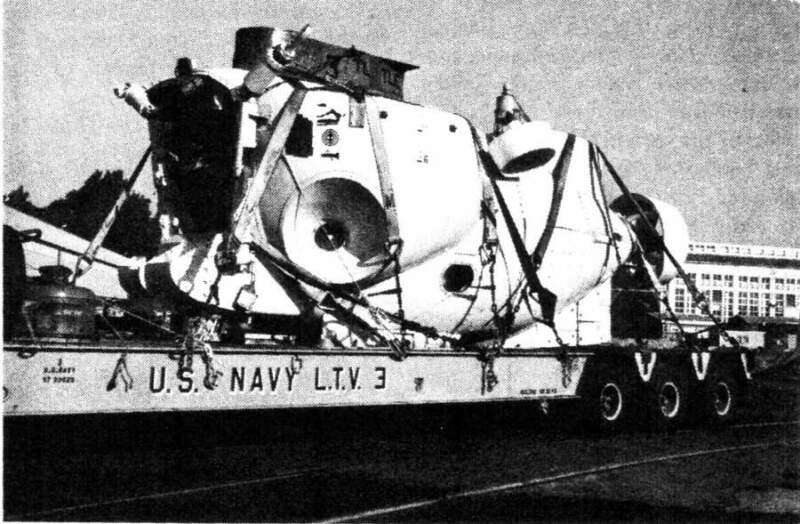 123k The DSVSS Laney Chouest, (Deep Submergence Vehicle Support Ship), hoists the Turtle (DSV-3) for a launching into the depths of the Pacific, circa 1988 - 91. Photo courtesy of Kent Weekly (Former EMCS/SS). 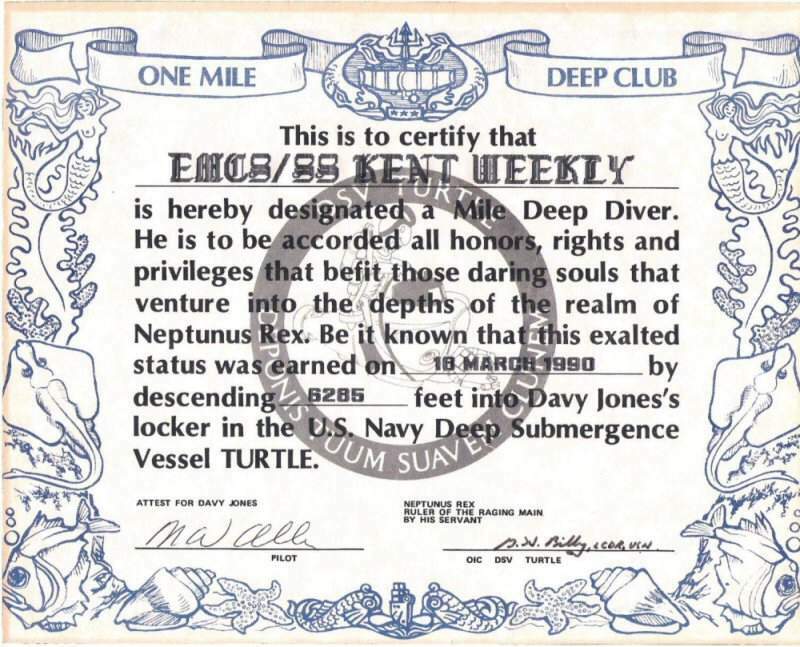 93k 1 Mile Deep Club certificate - given to members who dived deeper than one mile in depth. Photo courtesy of Kent Weekly(Former EMCS/SS). 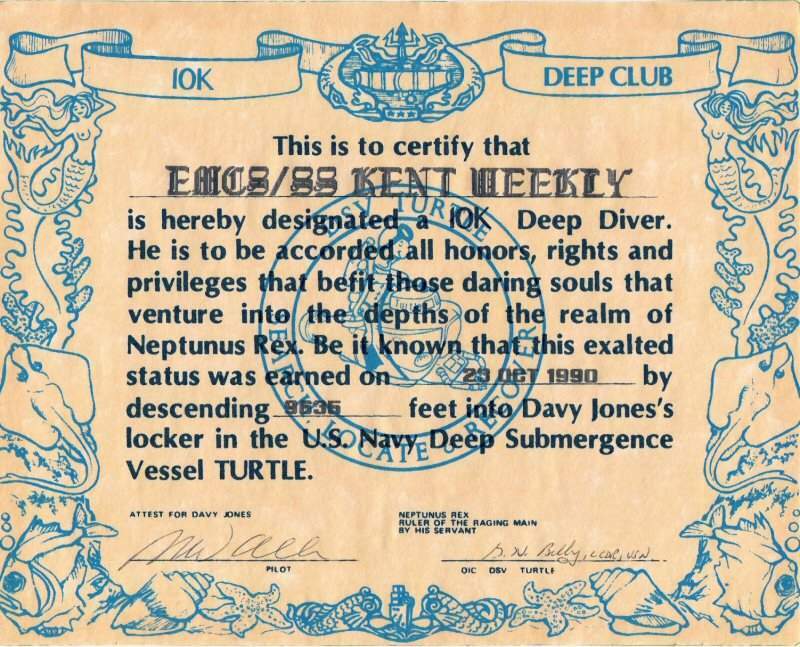 105k 10,000 foot Deep Club certificate - given to members who dived close to or deeper than 10,000 feet in depth. Note: The depth written on the image says 9636 feet. 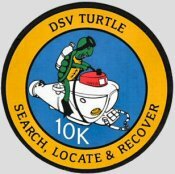 With a maximum depth of 10,000 feet, the Turtle (DSV-3) on this dive was within 10% of test depth. If a boat goes over test depth it is then limited to 1/2 of test depth so no submarine/submersible will ever push it's limit to the ceiling (forgive the pun, or lack of it). Photo courtesy of Kent Weekly (Former EMCS/SS). 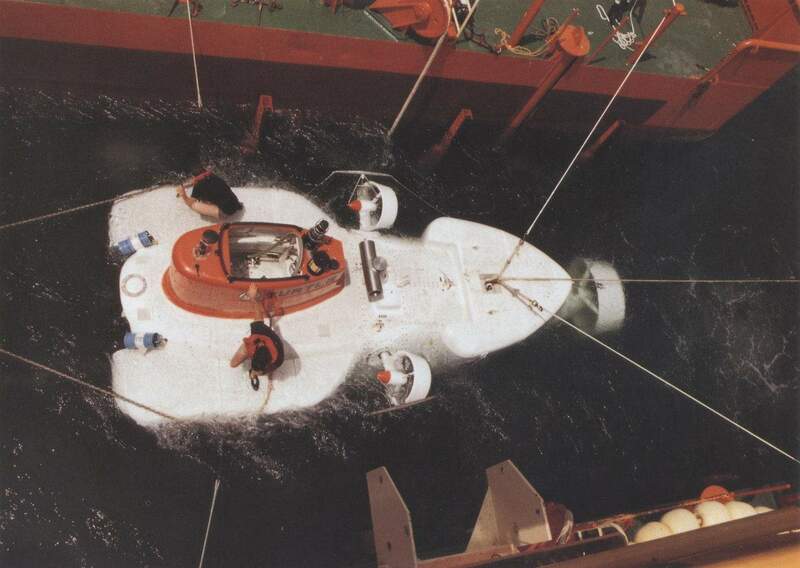 84k The Turtle (DSV-3) preparing for recovery. Crew onboard are IC2 Brian Main, on left, ET1 William Carpenter, on right. Photo courtesy of Kent Weekly (Former EMCS/SS). 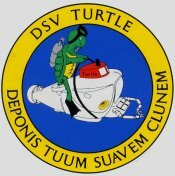 1.10k Pilot Certification for Turtle (DSV-3) Pete Juhos. Photos courtesy of Pete Juhos, MMCS(SS/SS1). 140k April 1987. 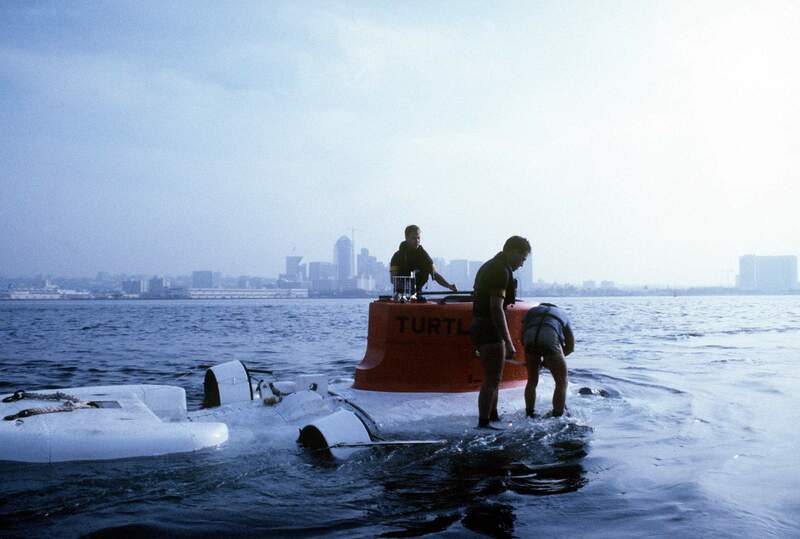 Turtle (DSV-3) has just completed an extensive overhaul / repair after a fire in August 1984. Talk about a total makeover. 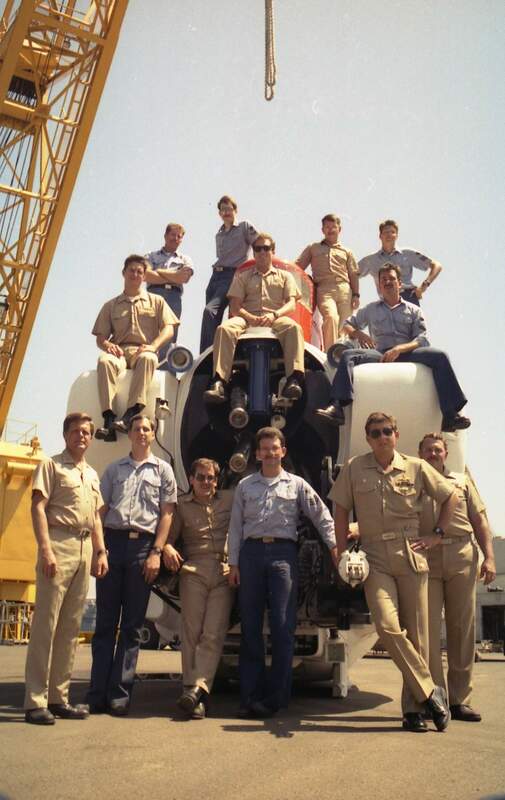 Frame was upgraded with additional support members to use a Calley A-Frame launch system (like what Alvin(DSV-2) uses with Atlantis II), new manipulators (one Western Space & Marine [WSM] force-feedback unit (stbd), and a more sturdy work manipulator designed and built by Naval Ocean Systems Center (NOSC); new color tv camera, new CTFM sonar, new silver zinc batteries, new electrical cabling harness external are pressure-compensated oil filled (PCOF) instead of the hard rubber with encapsulated connectors; new mercury trim tanks, new electronics in the sphere, new variable ballast pumping system�and new paint! Still rated to 10,000 feet. And, we have Alvin's old personnel sphere�the one that Alvin had on board when she was lost during a launch accident from M/V Lulu. Photo courtesy of Pete Juhos, MMCS(SS/SS1). LT. Christopher J Kennedy (AOIC), LT William Drake (OIC), LT John Ferrer (Eng), ETC(SS/DV) Tim Loomis, EMCS(SS) Kent Weekly, MMCS(SS/DV) Dennis Rasnick (COB), ICC(SS/DV) John Nelson, ET1(SS/DV) Keith Blum, MM1(SS) Pete Juhos, IC2(SS/DV) Russ Peterson, EM1(SS) Ed Mitchell, SK2(SS) Keith Boyer (out of picture) MM3(SS) Jeff Fisher. 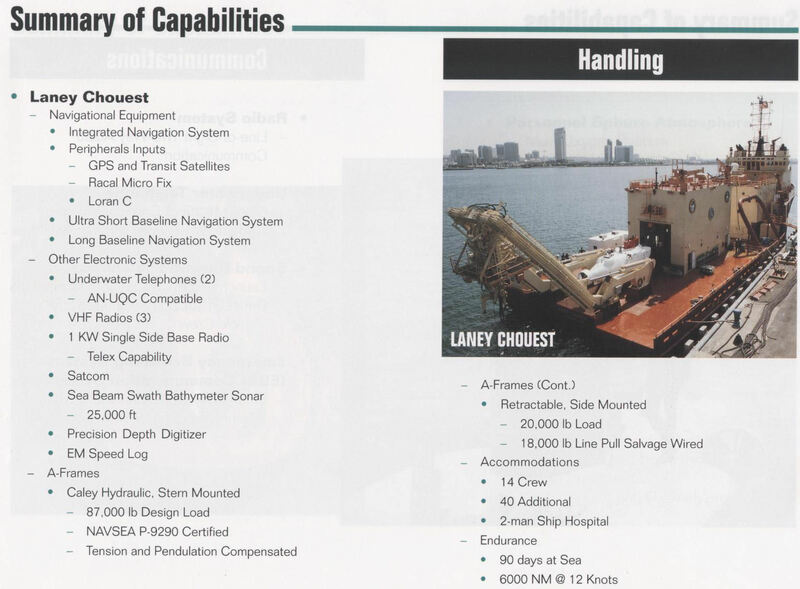 We were at the San Diego Naval Station at 32nd Street getting fitted on our new support ship, M/V Laney Chouest. Photo courtesy of Pete Juhos, MMCS(SS/SS1). 178k Looking like a bunch of deep sea diving cowboys, I suppose. Being transported by a YRDM (floating crane). April 1987; San Diego, CA. Photo courtesy of Pete Juhos, MMCS(SS/SS1). 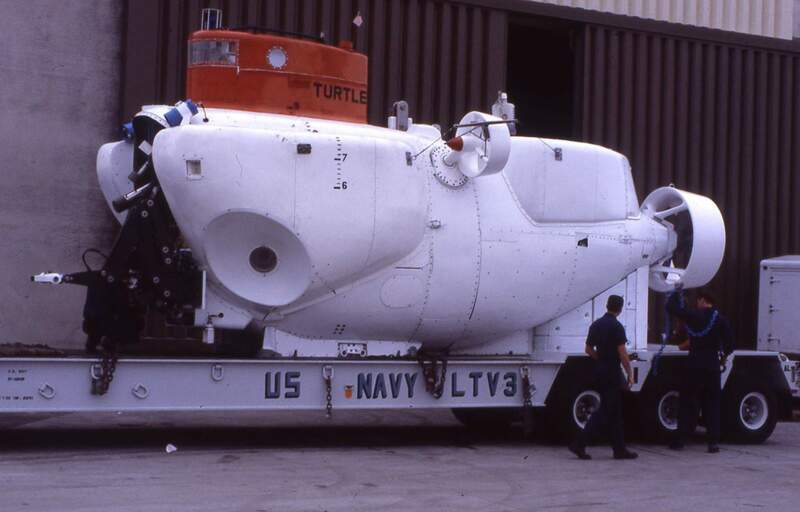 265k The US Navy (USN) 21-ton Deep Submergence Vehicle Turtle (DSV-3), Submarine Development Squadron 5 (COMSUBDEVRON FIVE), is prepared for hoisting from the deck of the Military Sealift Command's Submarine Support Vessel MV Dolores Chouest at Naval Air Station North Island (NASNI), California, after its return from sea trials on 1 October 1990. 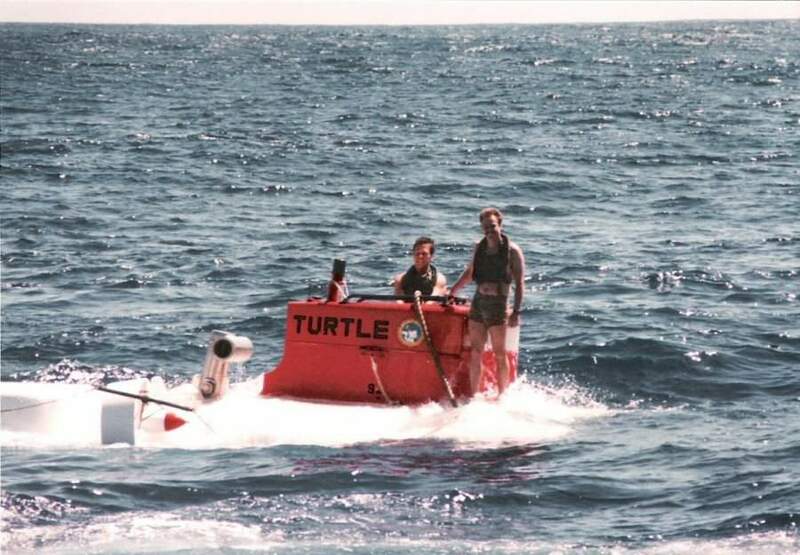 The Turtle is used in a wide variety of scientific research and recovery operations. USN photo # DN-SC-04-09583 from the Department of Defense Still Media Collection, courtesy of dodmedia.osd.mil. 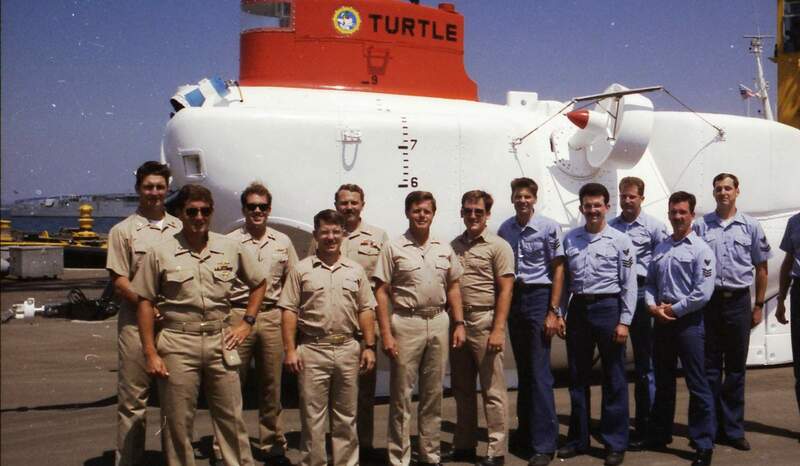 286k Crew members stand on the hull of the U.S. Navy deep submergence vehicle Turtle (DSV-3) after a dive during sea trials off North Island with the Turtle's support ship, the civilian vessel MV Dolores Chouest on 1 October 1990. USN photo # DN-ST-92-02126 from the Department of Defense Still Media Collection, courtesy of dodmedia.osd.mil. 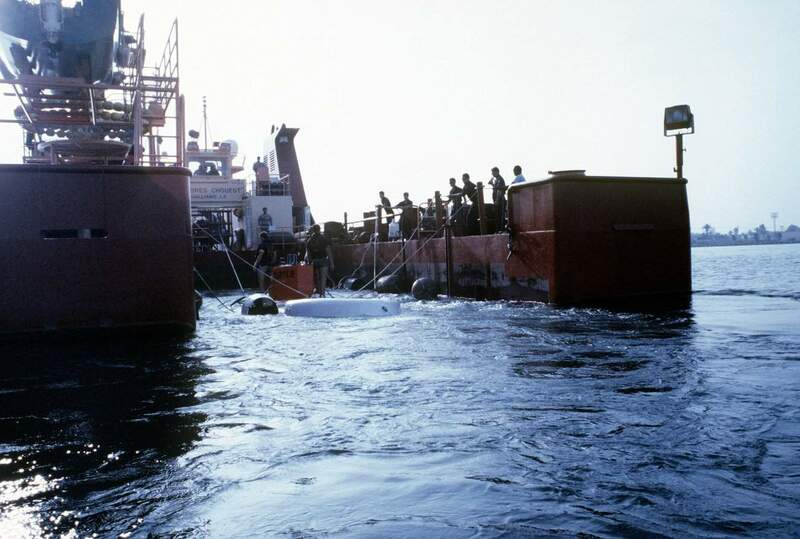 133k Crew members aboard the civilian support ship MV Dolores Chouest hold onto the mooring lines as the U.S. Navy deep submergence vehicle Turtle (DSV-3) ties up in the ship's docking well during sea trials off North Island on 1 October 1990. USN photo # DN-ST-92-02130 from the Department of Defense Still Media Collection, courtesy of dodmedia.osd.mil. 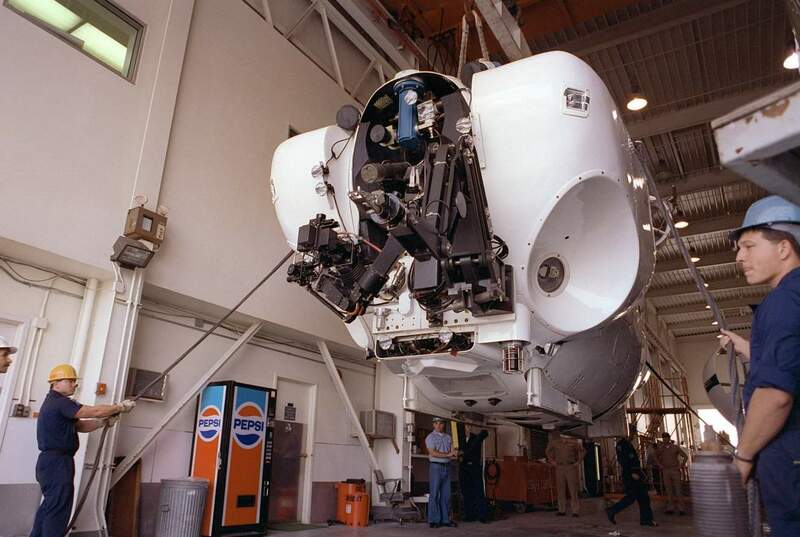 128k U. S. Navy personnel at the Deep Submergence Unit stabilize the deep submergence vehicle Turtle (DSV-3) with cables as it is readied for transport to a launch site on 1 March 1992. 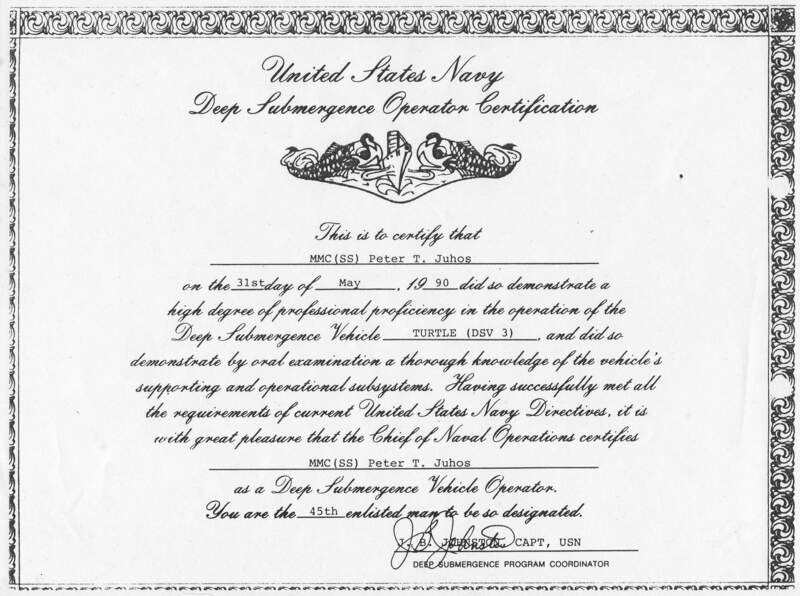 USN photo # DN-SC-92-08970 from the Department of Defense Still Media Collection, courtesy of dodmedia.osd.mil. 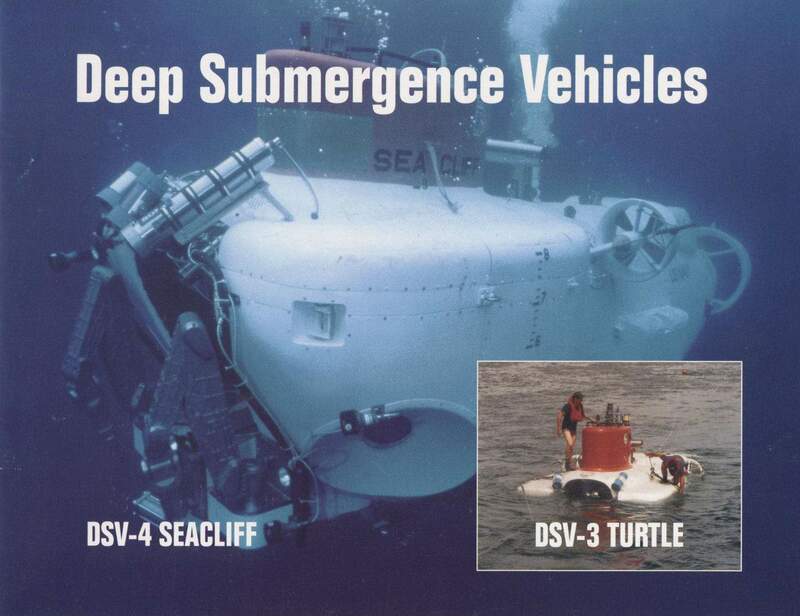 208k Booklet cover about the Turtle (DSV-3) & Sea Cliff (DSV-4) & published 31 March 1996. Courtesy of NAVSEA, submitted by Jim Richardson. 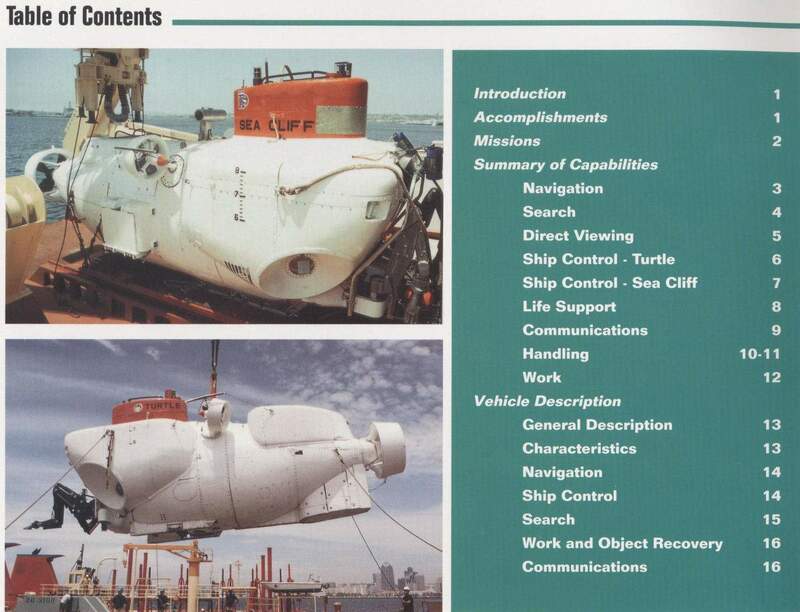 191k Booklet TOC about the Turtle (DSV-3) & Sea Cliff (DSV-4), published 31 March 1996. Courtesy of NAVSEA, submitted by Jim Richardson. 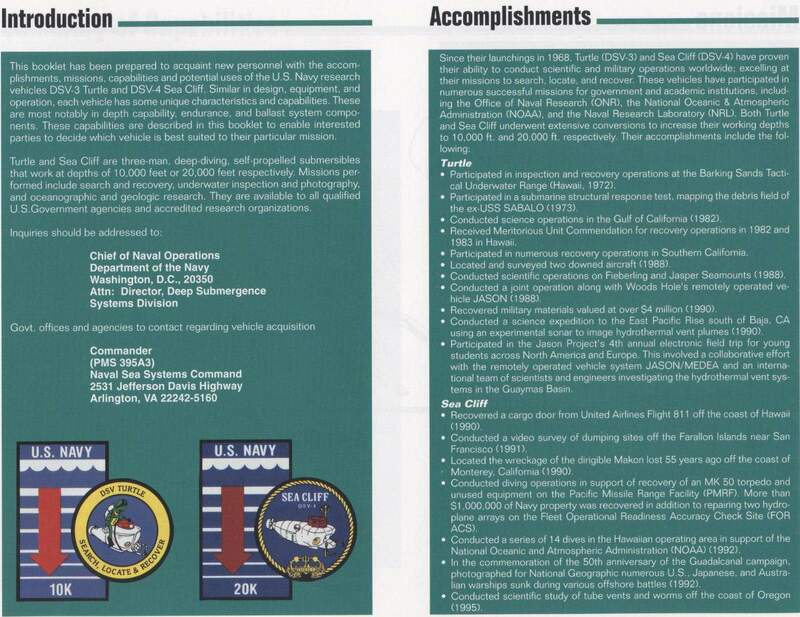 288k Page one, listing the introduction and accomplishments of the Turtle (DSV-3) & Sea Cliff (DSV-4). Courtesy of NAVSEA, submitted by Jim Richardson. 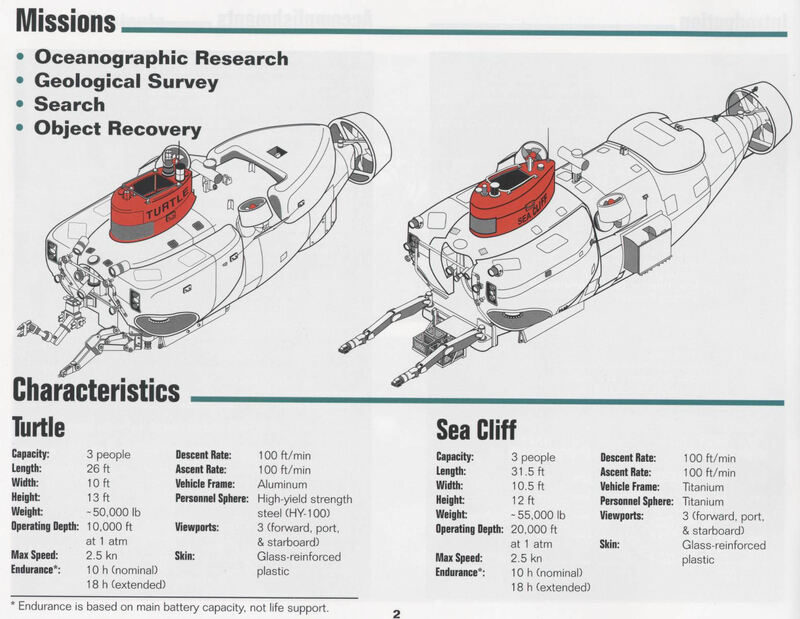 288k Page two, listing the characteristics of the Turtle (DSV-3) & Sea Cliff (DSV-4). Courtesy of NAVSEA, submitted by Jim Richardson. 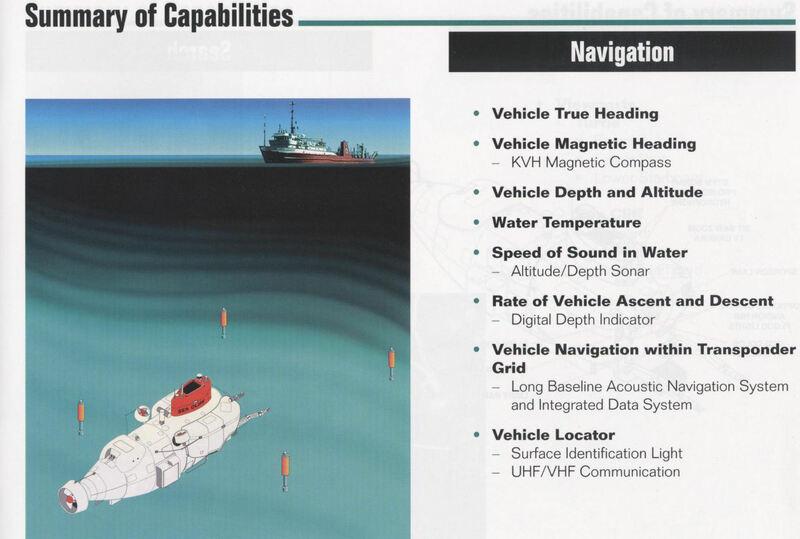 191k Page three, listing the summary of navigation capabilities of the Turtle (DSV-3) & Sea Cliff (DSV-4). Courtesy of NAVSEA, submitted by Jim Richardson. 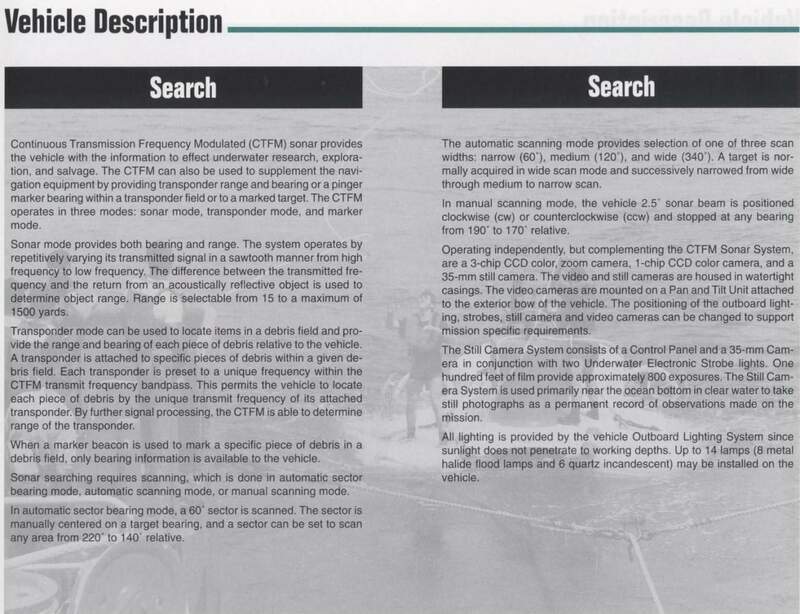 228k Page four, listing the summary of search capabilities of the Turtle (DSV-3) & Sea Cliff (DSV-4). Courtesy of NAVSEA, submitted by Jim Richardson. 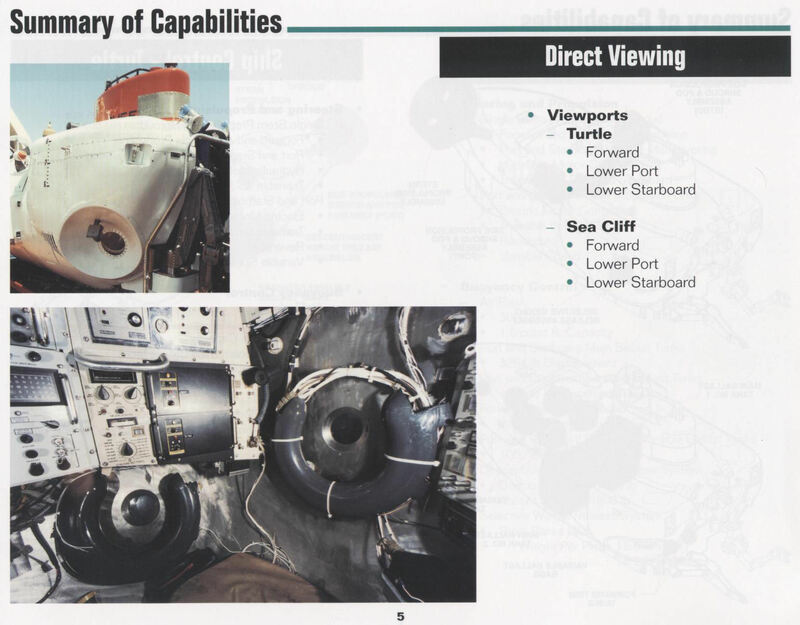 204k Page five, listing the summary of direct viewing capabilities of the Turtle (DSV-3) & Sea Cliff (DSV-4). Courtesy of NAVSEA, submitted by Jim Richardson. 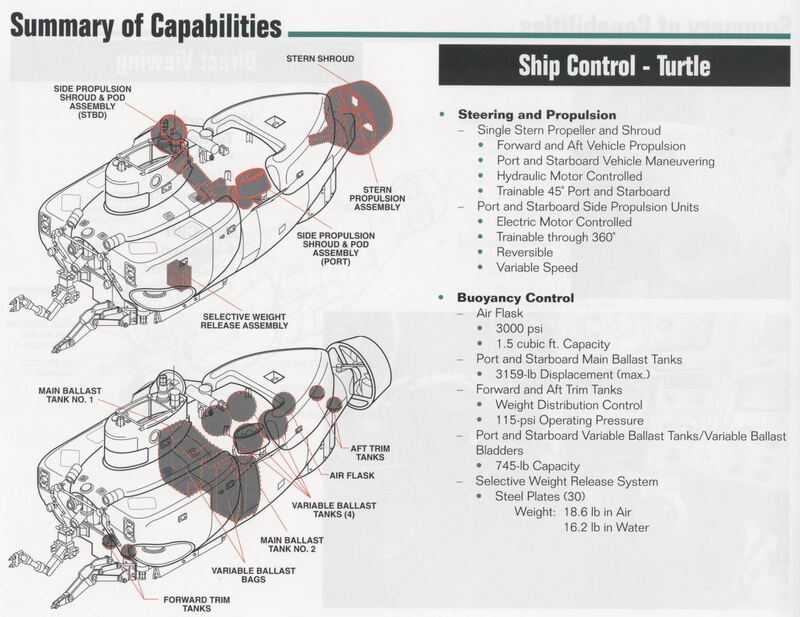 272k Page six, listing the summary of capabilities of the Turtle's (DSV-3) ship controls. Courtesy of NAVSEA, submitted by Jim Richardson. 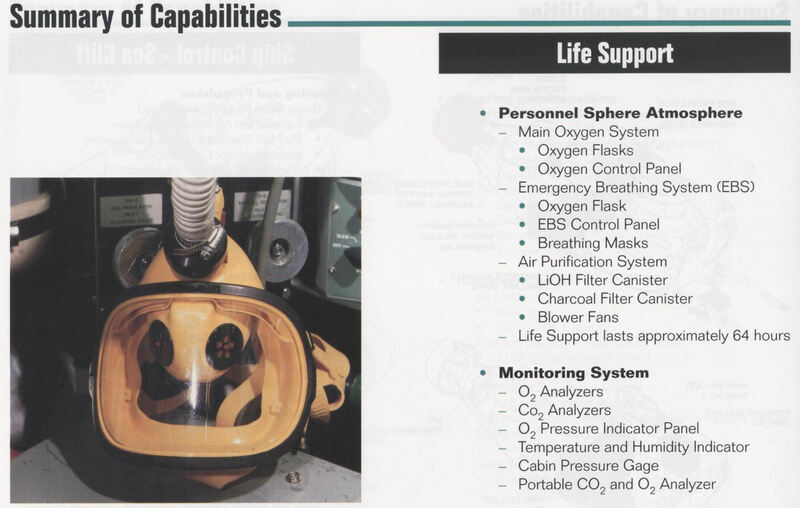 182k Page eight, listing the summary of capabilities of the life support systems of the Turtle (DSV-3) & Sea Cliff (DSV-4). Courtesy of NAVSEA, submitted by Jim Richardson. 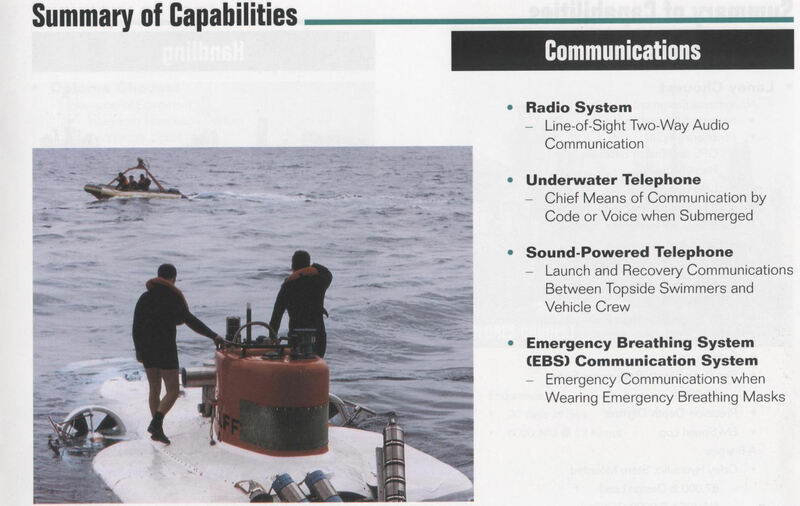 218k Page nine, listing the summary of capabilities of the communication systems of the Turtle (DSV-3) & Sea Cliff (DSV-4). Courtesy of NAVSEA, submitted by Jim Richardson. 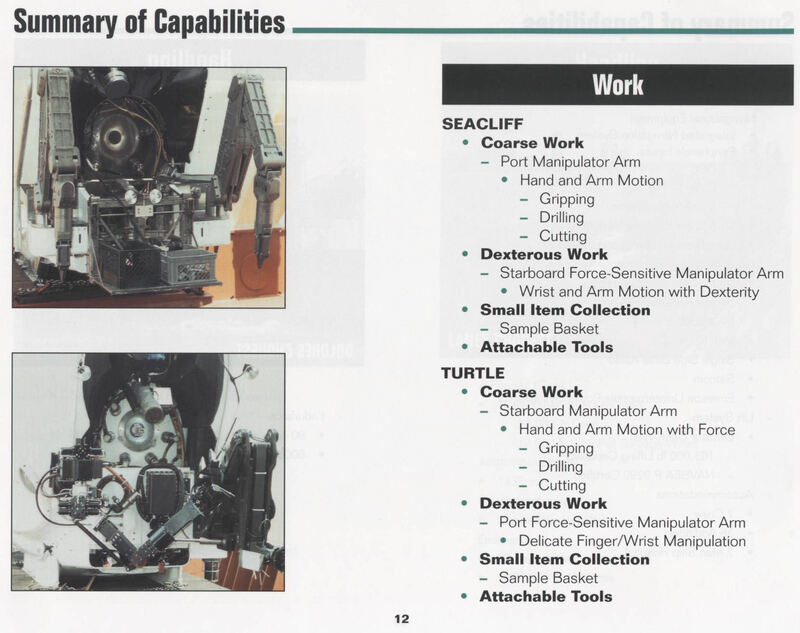 206k Page ten, listing the summary of capabilities of the handling systems of the Turtle (DSV-3) & Sea Cliff (DSV-4). Courtesy of NAVSEA, submitted by Jim Richardson. 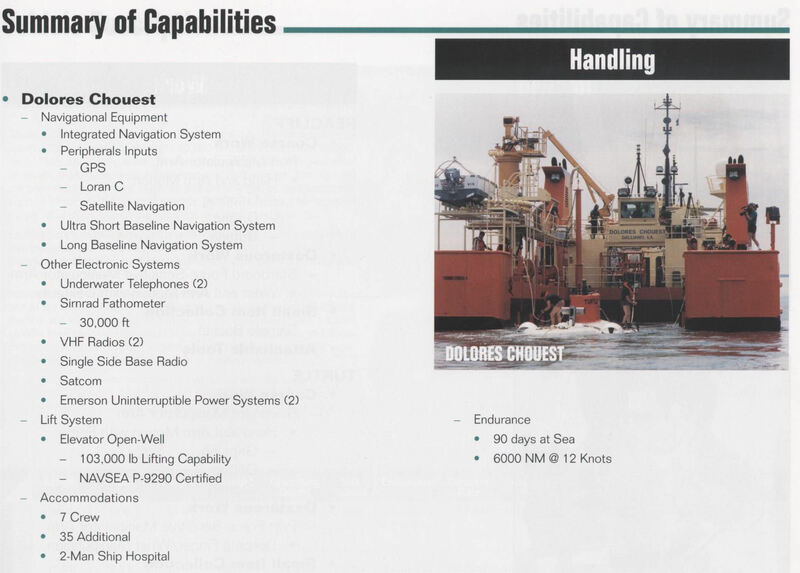 183k Page eleven, listing the summary of capabilities of the handling systems of the Turtle (DSV-3) & Sea Cliff (DSV-4). Pictured here is the Turtle coming along her support vessel Dolores Chouest. Courtesy of NAVSEA, submitted by Jim Richardson. 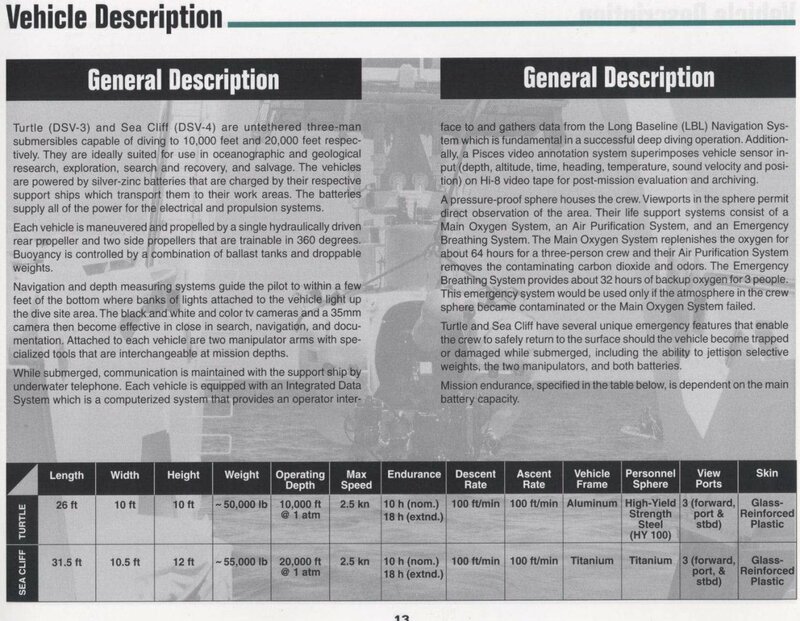 215k Page twelve, listing the summary of capabilities of the working systems of the Turtle (DSV-3) & Sea Cliff (DSV-4). Courtesy of NAVSEA, submitted by Jim Richardson. 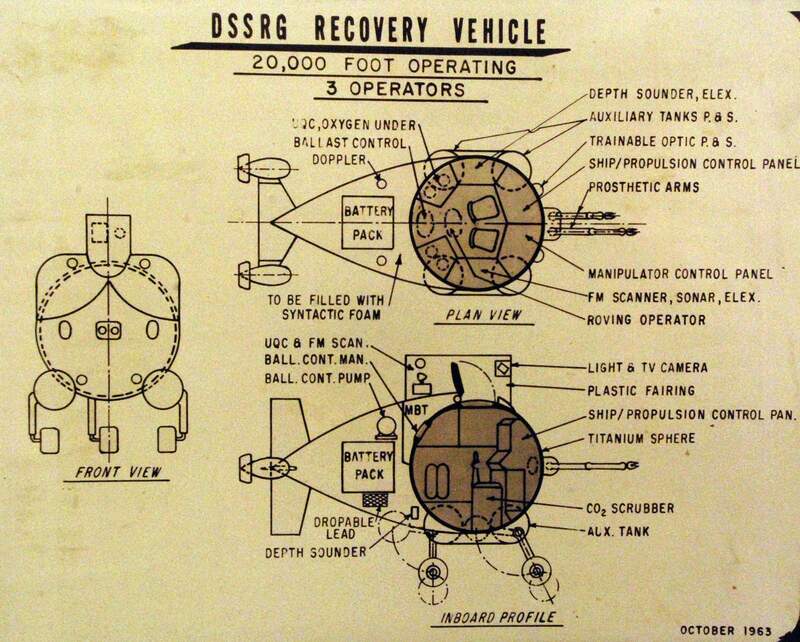 306k Page thirteen, listing the vehicle description / general descriptions of the Turtle (DSV-3) & Sea Cliff (DSV-4). Courtesy of NAVSEA, submitted by Jim Richardson. 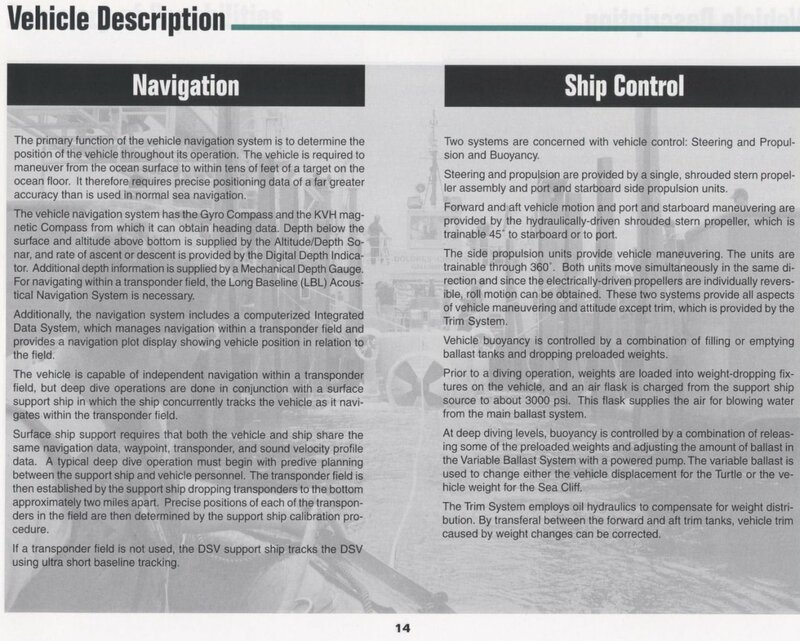 365k Page fourteen, listing the vehicle description / navigation & ship controls of the Turtle (DSV-3) & Sea Cliff (DSV-4). Courtesy of NAVSEA, submitted by Jim Richardson. 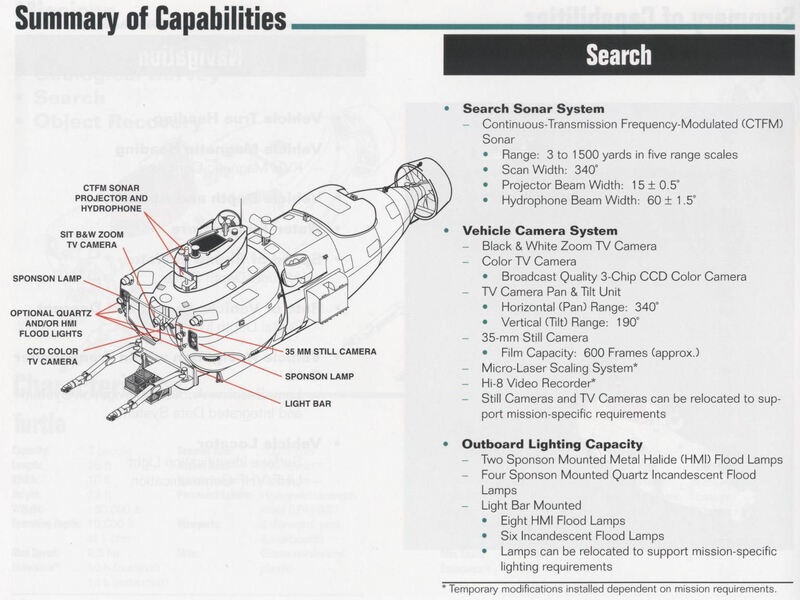 348k Page fiveteen, listing the vehicle description / search capabilities of the Turtle (DSV-3) & Sea Cliff (DSV-4). Courtesy of NAVSEA, submitted by Jim Richardson. 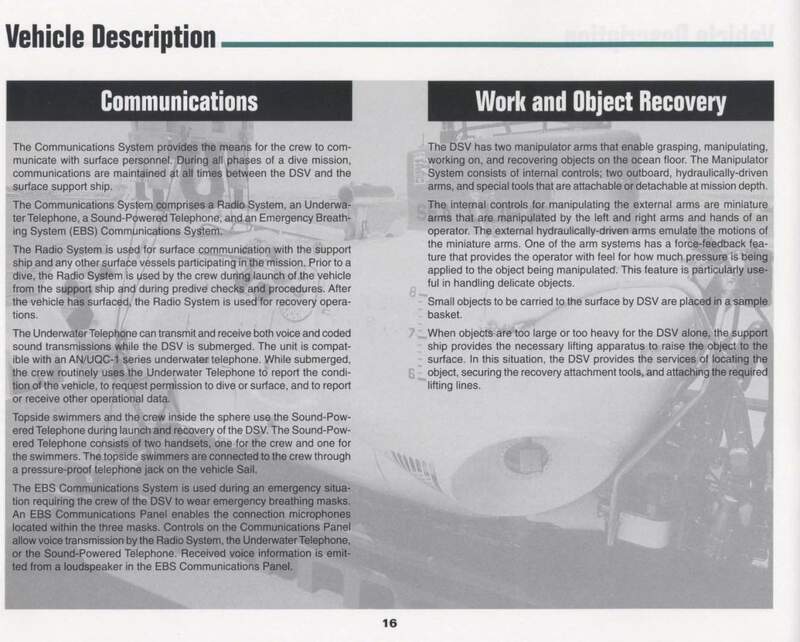 352k Page sixteen, listing the vehicle description / communications & work and object recovery of the Turtle (DSV-3) & Sea Cliff (DSV-4). Courtesy of NAVSEA, submitted by Jim Richardson. 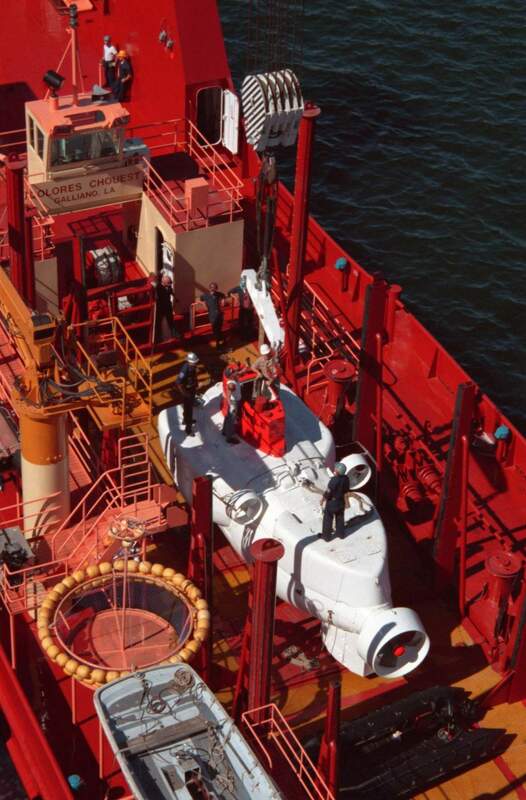 191k Inside back cover photo of the Turtle (DSV-3) being lowered from her support vessel. Courtesy of NAVSEA, submitted by Jim Richardson. 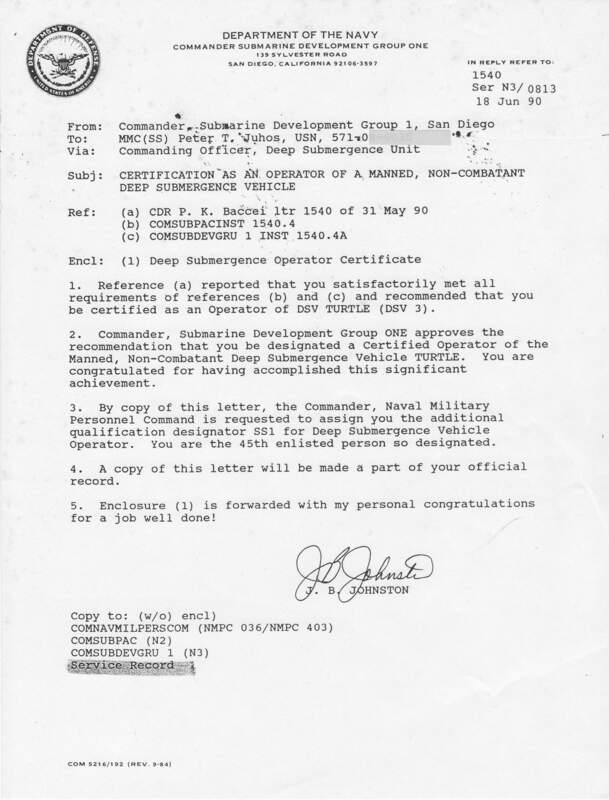 There is no DANFS History currently available for Turtle (DSV-3) at the Haze Gray & Underway Web Site, the main archive for the DANFS Online Project. This page is created by and maintained by Michael Mohl.